This is a project that is very dear to me. It is for my nephew Ryan. He LOVES fish tanks and I thought it would be wonderful to make him one that he doesn't have to change the water or feed the fish.. I wish I could take credit for this idea, but that goes to Kerri Hortle. Here is a link to her card on Pinterest. The moment I saw this, I knew I would make one for my nephew. Isn't she clever? So, here are the details on how this was made. I cut the box on my Silhouette Cameo using a cut file from a 3d fern box. It was square, so I had to manipulate it a bit, and I only used one piece from the cut file and removed the fern from the inside of it. I just didn't want to buy another box cut file. I measured and cut a piece of acetate to put on the inside to enclose the box. The background was made using Encaustic Wax on white card stock. I cut the piece to be a little bigger than the box and scored and cut the edges to make the inside of the box. That way, I could glue the sides of the bottom box to the top box to keep everything inside. I had to use glue dots, because the wax wouldn't hold white glue. I used black lava rocks from my stash for the bottom of the ocean. This was done by squeezing a generous portion of Martha Stewart white glue (dries clear) along the bottom edge, pouring the lava rock on top and setting aside to dry completely before dumping the excess back into the container. The coral was made using a McGill punch and then dipping it into colored UTEE using the melting pot. I did the orange first, and then added green and got this dark green effect. The fish are from Gina K. Design's Under the Sea set. They were stamped on white card stock and colored with Copic markers (orange fish - YR12, YR14, YR16; starfish - E11, E13; yellow & blue fish - Y04, Y06, Y08, BG02, BG05; turtle - YG21, YG23, YG25). One of the fish was stamped onto a clear block and then onto card stock, so I could get it faced in the opposite direction. I mounted the fishtank on a piece of black card stock, then added a 3-tiered, sponged set of rectangles and then the metal sentiment (Tim Holtz Ideaology Word Bands) and then used black metal circles to make it look anchored. I had the best time making this card. It has already gone into the mail to him today and I'm praying it makes it in one piece. I hope it doesn't get crushed. This is totally awesome, Susan! I love your work. And your nephew will love this beautiful fish tank, without a doubt! Just when I thought my card was pretty cool....This is unreal Susan....don't even know what to say! So much more work then mine. You need to enter this in a magazine....I'm not kidding! Ryan is going to love it!!! Wow! I am super impressed with that Encaustic background, how realistic can you get? You have done a fantastic job of this card and I am sure Ryan will love it. You have done me proud, lol! This is amazing! He will LOVE it. I LOVE it, lol. Your coral looks plastic it looks so real, you would never guess it was punched out of paper. Thank-you so much for sharing with us at Crafting With Dragonflies! 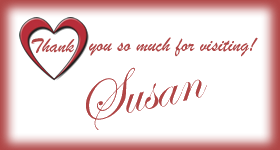 Beautiful work, Susan! The encaustic wax background looks phenomenal. Wish I could see it IRL. A stamping friend from Australia send me a beautiful piece of an encaustic wax creation she made, and I just love how this technique looks... So I know yours must be spectacular. Wow Susan, this is stunning!! Great scene and beautiful iamges! You know me.. way to many steps for me, but this is amazing and a work of ART! !